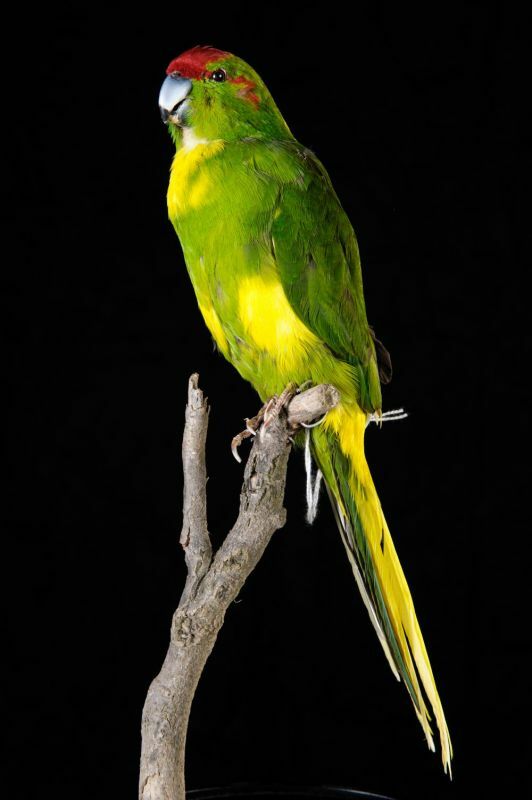 The red-crowned parakeet is the most common species of the genus. The name commemorates the Sparrman descriptor of the species, the Swedish naturalist Anders Sparrman (1748-1820). This bird has a mainly green plumage. The forehead is red. This coloration extends beyond the eyes in the form of a comma. Flight feathers are blue. The male is slightly larger than the female and has a more massive beak. The species measures between 27 and 29 cm long and weighs between 43 and 113 gr. This bird feeds frequently ground seeds, invertebrates and sometimes corpses. This bird is a very common Psittacinae in farms in its wild form and variegated mutations.